When you have some nice music on computer but you want play it on your iPhone. When you recently switched from your Android to iPhone and want to move your Android music to iPhone. Or when you have both iPad and iPhone, and you want to transfer music from iPad to iPhone. You may find it’s not easy to solve the above questions. There is no need to worry about how to transfer music to iPhone, the following post will provide you some easy methods to move music from computer, Android, or iPad to iPhone. When it comes to how to move music from your computer to your iPhone, there are two methods recommended. You may choose iTunes as the first choice, the third-party software is also helpful for you to transfer music from computer to iPhone. Step 2. Click the phone icon on the left corner of the interface. To manage your media files manually, you’d better go to “Options” under “Summary”tab, cancel “Automatically sync when this iPhone is connected” and check “Manually manage music and videos”. Don’t forget to click “Apply” when it’s done. Step 3. Import music into iTunes library from computer by clicking “File” and then “Add File to Library”. Once transferred successfully, you can select the music icon on top to see all the songs. Above steps is about how to transfer songs from computer to iPhone with iTunes. Though it’s widely used by many Apple users, there are some unavoidable shortcomings that you need to know. 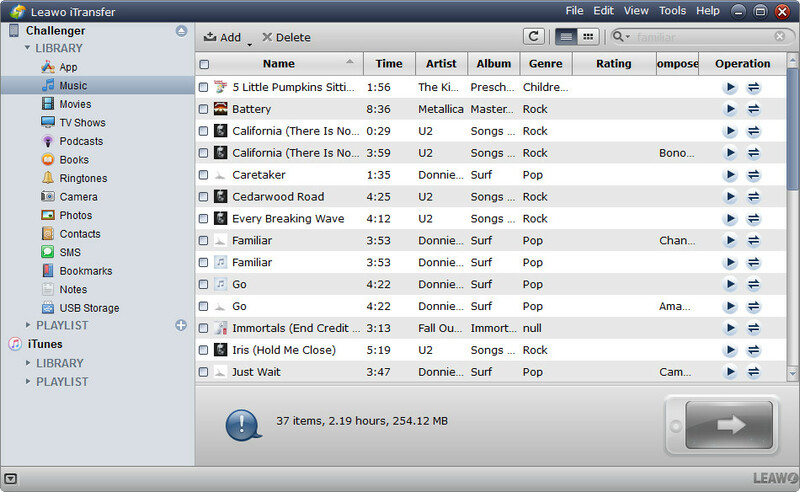 Using the third-party software can help you to transfer music from computer to iPhone without erasing previous songs or transfer non-purchased music from computer to iPhone. Leawo iTransfer, one of the best alternatives to iTunes, supports to transfer files among iOS devices, iTunes and PCs without the sync of iTunes, and it enables users to transfer various kinds of files easily. 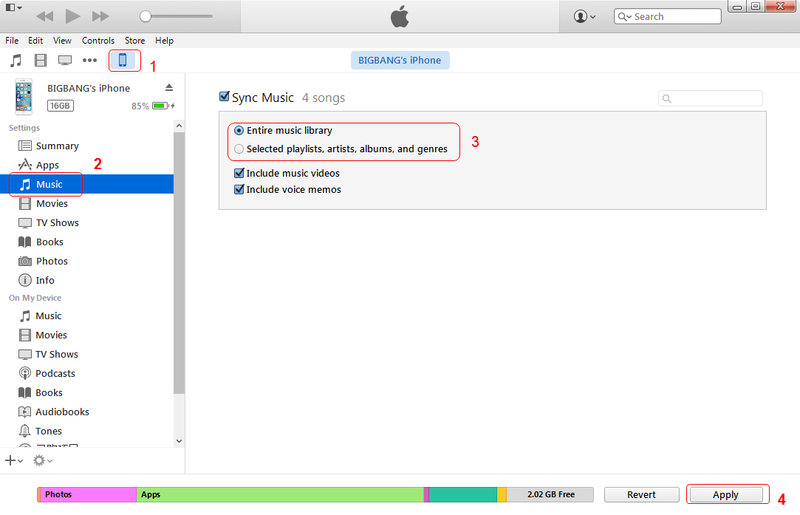 The following guidance will show you how to transfer music from computer to iPhone without iTunes. Step 1. 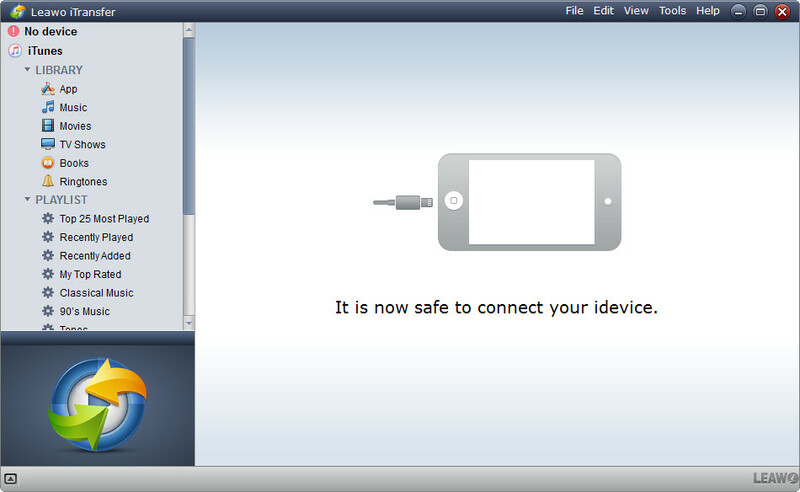 Run the Leawo iTransfer and connect iPhone to computer with USB cable. Step 2. Add music you like from computer to iPhone. What if you love some songs on your friend’s android phone and you want to transfer them to your iPhone? Or what if you become an iPhone user and want to transfer music files from your old android phone to your new iPhone, like iPhone 6S? Have no idea about how to transfer music from android to iPhone? ?There are three methods that can help you solve the problem. The first method is by using Apple’s official Move to iOS app to transfer music from android to iPhone. But here are some limitations for your devices. For example, your iPhone have to be iPhone 5 or later, and iOS 9 or later. Besides, your android version have to be 4.0 or later. Moreover, the media files like music, movies and more won’t be transferred as well with Move to iOS app. 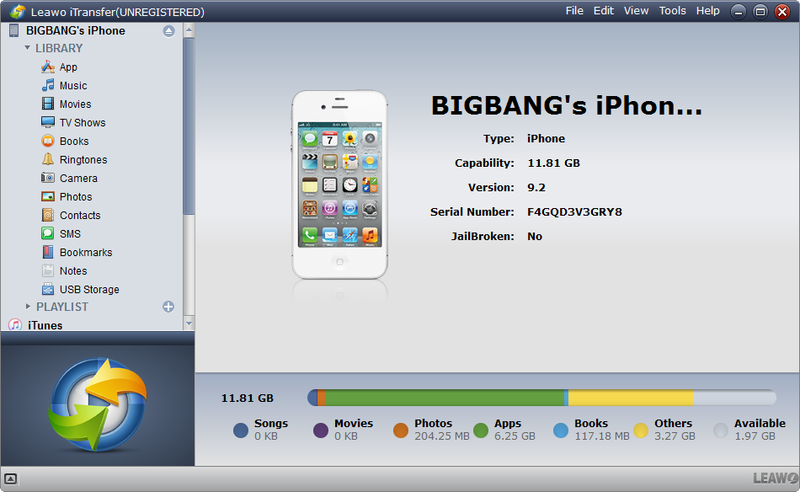 iTunes is another good choice for iOS users to transfer music from android to iPhone. 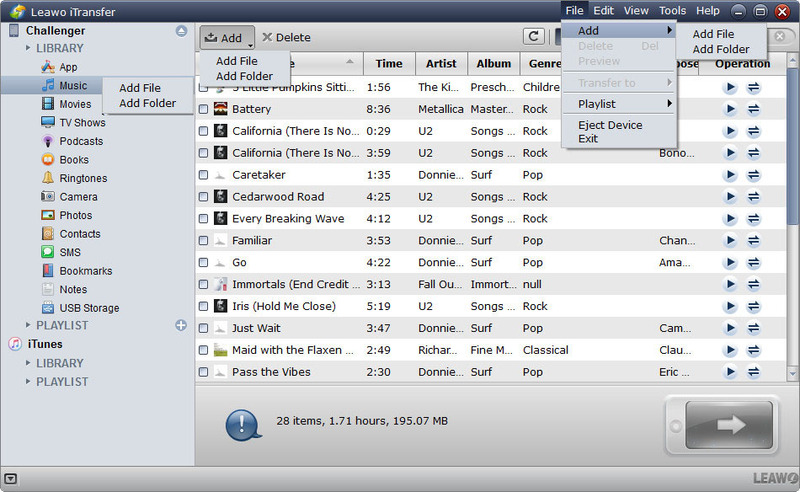 You need to get music files from your Android and onto your PC or Mac, then open iTunes on your computer. Go to Library, and click Music. 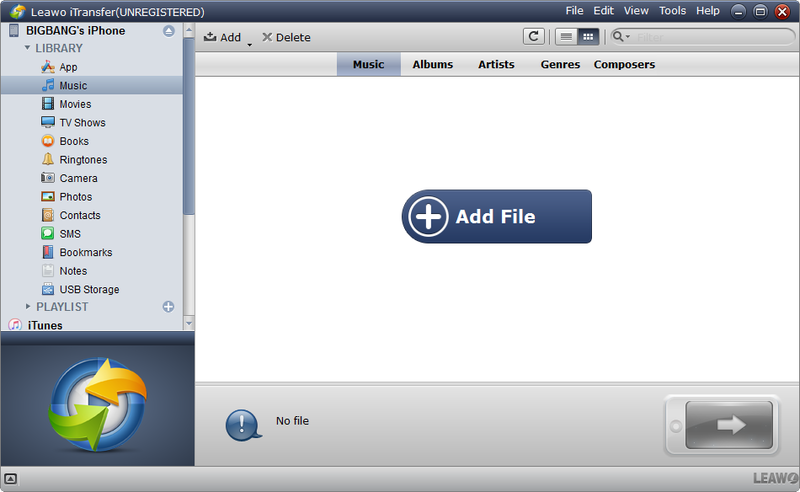 Open the folder into which you put your music files, and drag them to the Music view in iTunes. Now connect to your iPhone, click iPhone, and then click Music. 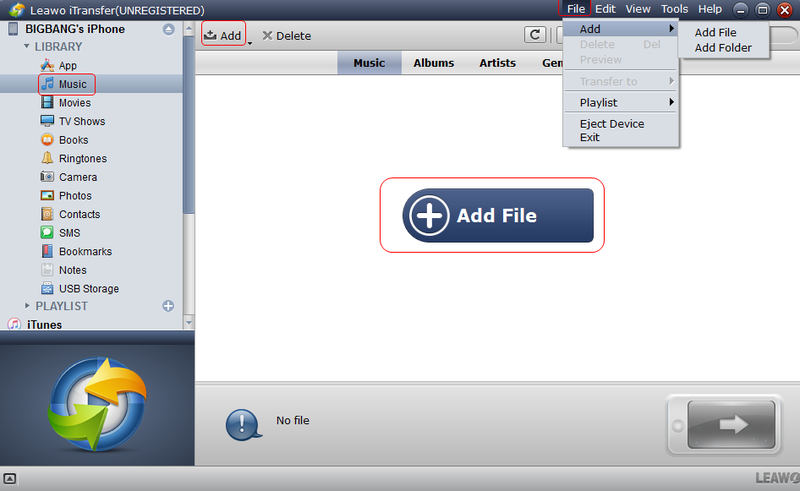 You can choose to sync your entire music library, or select playlist, artists, albums and genres. Then click “Apply” button and the songs will be added to your iPhone. 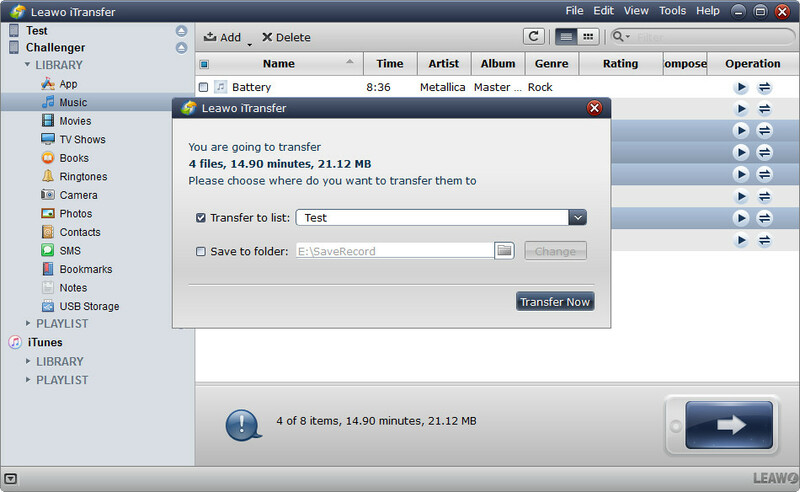 Leawo iTransfer is a piece of powerful and easy-to-use software to transfer music, videos, photos and other files among iPhone, iPad, iPod, iTunes and computer. And it also helps to backup iPhone, iPad and iPod data to computer. The following guidance will show you how to transfer music from android to iPhone with the alternatives to iTunes with ease. Step 2. Click the name of iPhone and choose Music in the left sidebar. Then contents will show up in the right part. Step 3. 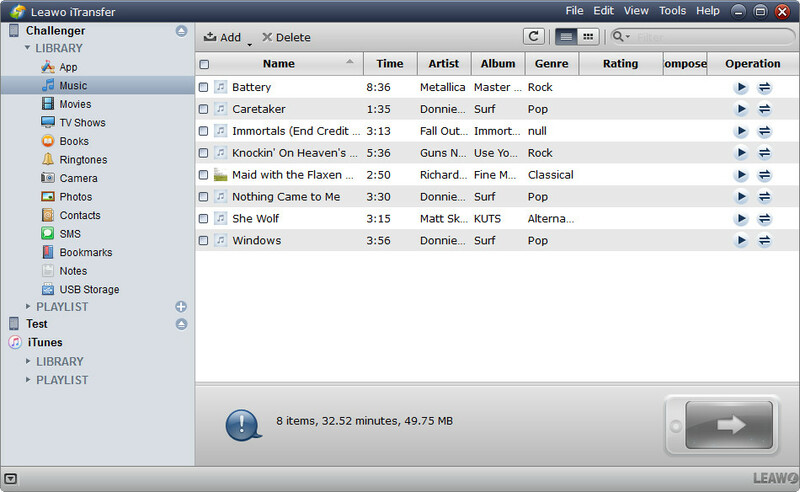 Add the music files from your computer, or the music folder on your Android device. Of course you should connect Android phone to computer with the USB cable. 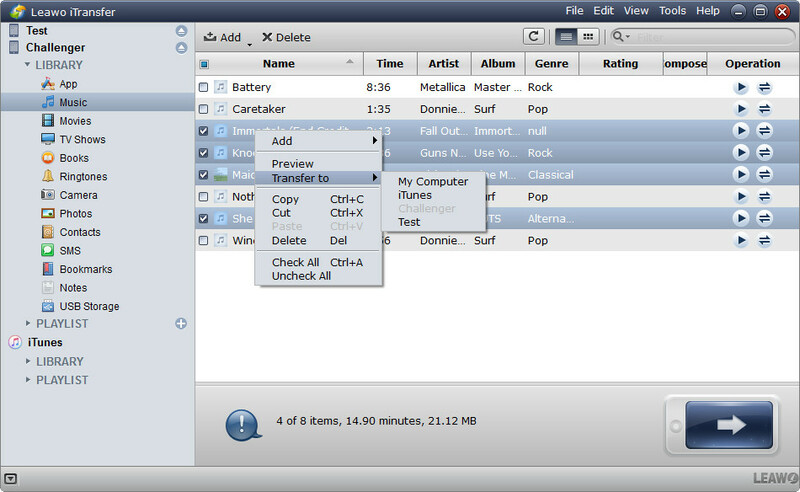 Note: There are five methods to add music: drag and drop music files directly into the window of the software; click “Add File” button on the middle of the interface; click “Add” button on the top left of the interface; right-click the name of the library and choose “Add File” or “Add Folder”; or click “File” on the upper right corner of the software window, and then choose “Add > Add File/Add Folder”. Don’t worry, it’s not difficult for you to transfer music from iPad to iPhone. The post aims to introduce you how to transfer music from iPad to iPhone without data loss. 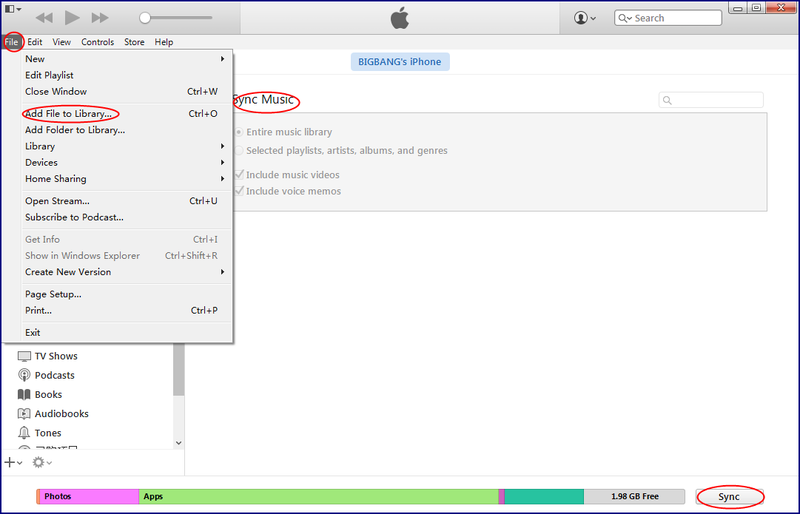 iTunes allows you to transfer purchased music from iPad to iPhone. You are able to transfer the purchased albums back to iTunes Music Library, and then sync to your iPad again. Syncing files from one iOS device to another with iTunes is a little complicated, and iTunes will erase all the albums and playlists in your iPad Pro when you sync music. Besides, iTunes only supports to transfer purchased music from iOS device to iTunes Music Library, other non-purchased music are not allowed. 1.Plug in iPad to computer and open iTunes. 3. Plug-in your iPhone and sync all the music from your computer to your iPhone. If you don’t want to lose music in your iPad or you want to transfer non-purchased music from iPad to iPhone, you need to figure out another way to transfer music from iPad to iPhone without iTunes. You will need a piece of third-party iPhone transfer software to solve this problem. Among all the iPhone transfer programs, Leawo iTransfer supports to transfer files without iTunes. This software is used for transferring files among iOS devices, iTunes and computers, and it can help users to get rid of the sync of iTunes completely. The following guidance will show you how totransfer music from iPhone to iPad without iTunes, and you can free download the software to have a try. Step 1. Run Leawo iTransfer and connect both iPad to computer with USB cables. Step 2. Click the name of iPad and choose Music in the left sidebar. The songs will display in the right part. Step 3. Click the transfer button at the right bottom to transfer all songs. Or hold Ctrl/Shift key to select certain songs, and right-click the selected song, then choose Transfer to > iPhone. Step 4. Check Transfer to List and choose iPhone as a target in the pop-up dialog after clicking the transfer button. Then click Transfer Now at the right bottom to start transferring music from iPad to iPhone.